Write Newton's first law of motion. Write Newton's second law of motion. Write Newton's third law of motion. _________℃ What is the temperature of a mix of melting ice and water? _________℃ What is the temperature of melting solidified coconut oil? _________℃ What is the typical daily indoor room temperature in Pohnpei? _________℃ What is the outdoor temperature for a black object in the sun at noon in Pohnpei? _________℃ What is the temperature of the healthy living human body? _________℃ What is the temperature of a boiling water? A physical science class gathered the following data for laboratory six: heat conduction. The x-axis is the change in temperature (ΔT = maximum − start). _______________ Which material was the best conductor of heat? _______________ Which material was the least conductor of heat? 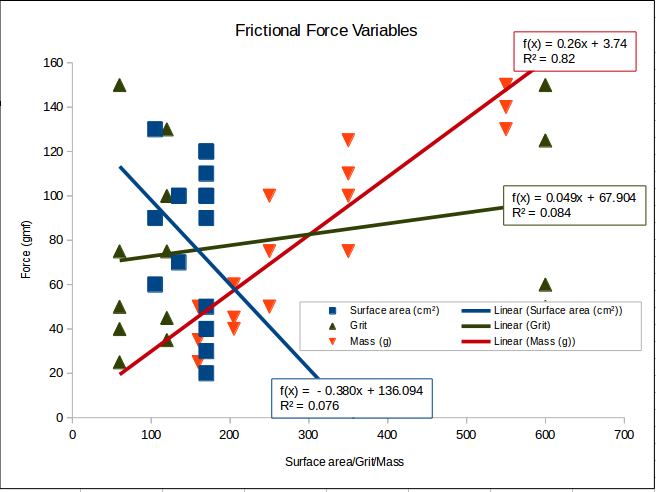 The graph shows force of friction data for surface area, grit, and mass. _______________ According to the data gathered, which variable has the most effect? Using the chart and analysis above, explain why you say that variable has the most effect. _______________ According to the data gathered, which variable has the least effect? Using the chart and analysis above, explain why you say that variable has the least effect. Explain the difference between heat and temperature.